The paintings included on the Heidelberg School Artist’s Trail that reside in the Mt Dandenong area were all inspired by the surroundings the artists painted in. Many of these scenes still exist today and the display boards allow you to view the paintings inspired by the scene. Download the Villages Map for locations of these views. Imagine unwinding in the beautiful surrounds and tranquility of the Dandenong Ranges.Balance Therapies is a stunning Day spa located in the heart of Mount Dandenong. Offering a range of massage and day spa treatment including; Remedial to Relaxation Massage, Body treatments, Facials, Beauty treatments, Waxing, Tinting, Manicures, Pedicures, Day packages, Hydrotherapy spa, Naturopathy, Yoga. Treatments are designed to relax your mind, detox your body and nourish your skin.Using Botanical products, treatments are customised to suit your individual needs. With a wonderful team of therapists we cater for couples and group bookings. Perfect for hens’ gatherings, bridal parties, conferences, group weekends away or simply time out for yourself. We can offer you full box office facilities, including online ticketing, and marketing support if appropriate. Enjoy a self-guided tour, strolling through 40 hectares of scenic botanic gardens or a picnic by the lake and take in stunning views of the Australian Alps. Photograph the native birdlife and brilliant floral scenery. During the Spring Floral Festival held annually from August to November visitors can enjoy a series of undercover floral displays, including the largest undercover display of daffodils in the Southern Hemisphere. The garden has a gatehouse, gazebos, grassed picnic areas and toilet facilities for people with limited mobility. There is a gardens giftshop stocking a wide range of gifts including limited edition prints, gardening books and garden ornaments. Café Vireya is currently closed but is available for large group bookings. For café group bookings only phone (03) 9751 0443. For all other enquiries please contact Parks Victoria on 13 1963. Playing Olinda isn’t just an ordinary game of golf. Not for the faint hearted, if the magnificent views from most holes don’t take your breath away the undulating topography of the unique course will! Up hills, down dales, around bends, Olinda will really test your accuracy and stamina! Equipment hire is available so you just need to bring some energy. Because of the relaxed atmosphere, the Olinda Golf Course is an ideal course for Corporate golf days, social or charity fundraising games. The Olinda Golf Course is ideal if you are a beginner, want to pickup your game or just grab a lesson with our golf teaching professional (booking required). Regardless the course & views are memorable. A round of Golf along with golf clubs, cart or buggy hire can be arranged in either the Pro Shop or the cafe. 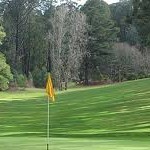 What better way to enjoy the Dandenong Ranges. The Dandenong Ranges Open Studios Weekend features an eclectic range of artists and media against the backdrop of one of Melbourne’s most beautiful and popular tourism destinations. 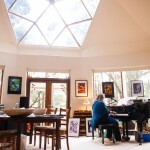 The Open Studios weekend, featuring around 30 local hills studio locations, is one of the most anticipated events for the region’s cultural calendar, attracting art minded visitors and tourists since 2004. 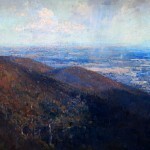 Featuring Hills artists working across a range of mediums – as varied as painters, potters, wood carvers, digital artists and didgeridoo makers – the Dandenong Ranges Open Studios program provides a unique insight into our artists’ work environments as well as their art. 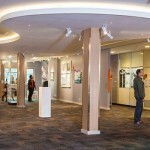 Coinciding with the Open Studios weekend is the annual OPEN STUDIOS EXHIBITION at Burrinja Gallery. This exhibition is a unique opportunity to see and experience work from each of the artists in one gallery, making Burrinja a great place to start the Open Studios Weekend tour. Your farm experience will include all aspects of fruit growing, picking, packing, handling and growing methods. Part of this farm experience will of course be eating as much of our fabulous fruit as you can. You can also take some home with you. There are also yabbies in the dam (fresh water crayfish) if you wish you may catch a few. Remember we grow around 250 varieties of stonefruit including peaches, nectarines, plums and apricots plus a large range of interspecific varieties. Morning, afternoon teas and lunch will be provided by chef Dudley in our café. The freshest fruit is the fruit taken straight off the tree. Peaches, Nectarines, Apricots and other varieties to select from. It’s the ‘Garden of Eden’ in the Yarra Valley… and you can take an Orchard Walk through the groves of stone fruit trees, sampling the freshest fruit, and enjoying the company of one of our staff explaining about the fruit of our trees. Bookings for walking or tractor Orchard Tours are essential, so call us. 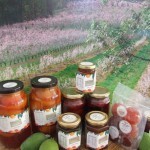 Rayner’s Stone Fruit Orchards are committed to providing the best quality stone fruit in Melbourne. With over 250 varieties of fruit, all grown in our own orchards in the pristine Yarra Valley, our fruit is hand picked daily for delivery to our retailers, and farmers produce markets all around Melbourne! Get some perspective & escape the noise and pressures of the concrete jungle. Less than one hour from the Melbourne CBD you can be SkyHigh on the uppermost reach of the Dandenong Ranges, amid cool fern glades and lush towering native forest, looking at the big picture, from the Mornington Peninsula across the majestic sweep of Port Phillip Bay, surrounded by Melbourne’s growing urban fringes, to the You Yangs on the southern horizon. After sunset the southern sky, brilliant in the clear mountain night, is imitated by a spectacular carpet of glittering city lights. First established as a survey point in 1861 this historic area, which has recently undergone a lavish and sympathetic redevelopment, affords a unique overview of Greater Melbourne. Enjoy the unparalleled vista from the SkyHigh Bistro/Restaurant or fire up a public barbecue, spread a rug and picnic on the elevated viewing terrace. 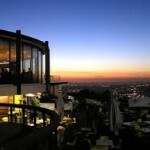 SkyHigh Bistro/Restaurant offers contemporary dining for all the family to enjoy. Our Head Chef has designed a menu with a modern Australian flavour, catering to a broad range of tastes, including vegetarian and gluten free offerings. In Winter, dinner in front of our large open fire place is a popular choice, but when the sun appears alfresco dining in our new pavillion or a window seat inside our stylish Bistro/Restaurant is the place to be. Breakfast and lunch is always a casual affair, at night the SkyHigh Bistro transforms into a sophisticated and intimate Restaurant and is a great venue for a celebration. The SkyHigh restaurant is located on the ground floor of the building, the top function room is for private hire only unless you are booking our Sunday Roast lunch or Afternoon Tea. IMPORTANT – Space in the trees is limited so booking a spot is really important. Make sure you book online or phone us before you make the drive! IMPORTANT – ALL Participants (including adults) need a waiver signed. Participants under-18 years need a waiver signed by their own parent. You can have forms signed by your parents in advance if you are coming with other relations or friends! Download the Villages Map for locations of all these popular walks. After a good rain the falls should be flowing so it is worth the 45min round trip. This is reasonably steep and if you want to make it a longer walk you can take the track from Mechanics Reserve on the Mt Dandenong Tourist Rd. Join the Kyeema Track after viewing the Memorial which the marks the spot where the Kyeema aircraft crashed on 25th October 1938. This scenic track takes you around to the base of SkyHigh where you can drop in for a refreshing drink before returning. 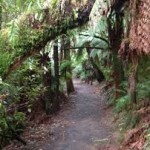 This easy Interpretive Walk takes you back in time to ancient origins with signs that will introduce you to the cool temperate rainforest. A favourite with football teams for training and those interested in the history of the Kokoda Track. This moderate to steep 3km loop has commemorative plaques along the way depicting the lives of Australia soldiers who fought and died in Papua New Guinea during WWII. 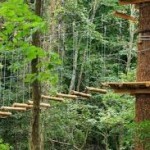 This moderate walk will take you about 1 hour to complete through the forest. There are also a number of other walks that start and finish here. This longer walk is moderate to difficult so allow yourself plenty of time to complete the loop and take some water on a warm day. Wild about Tours is a very personal experience, taking you to the finest destinations in The Dandenong Ranges and Yarra Valley. Jilly is your personal tour guide, taking groups of no more that 6 at any one time. She lives in The Dandenong Ranges and is passionate about the region. 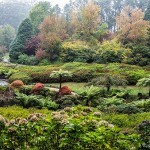 Although only an hour from Melbourne, when you enter the Dandenongs you are in another world, with its unique cool rain forest and boutique villages, fabulous restaurant’s and beautiful accommodation. 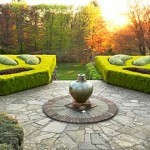 Tours are either full days or half days and are flexible. We can mix and match tour content to ensure you have the very best experience possible. All tours include pick up and drop off within a 10 km radius of Olinda. 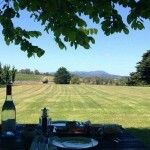 Most tours include a glass of wine with lunch and wine tastings, so you can relax and be driven for the day. FUN WITH FOOD DEMONSTRATIONS $45 – $65Ben guides you through several dishes with the subject changing from class to class. There is plenty of fun and hands on cooking. Try something new like fresh pasta making with the advantage of a professional on hand for those special tricks that only chefs seem to know. This is a great social night to enjoy with your partner or friends. Ben takes you through step by step as you follow along in an enjoyable and informative morning of hands on cooking. 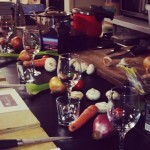 You’ll learn how to prepare, cook and present a three course meal to impress, whilst learning the tricks of the trade. You can then enjoy your lunch in The Wild Oak Restaurant. Ben along with an invited guest chef, guides you step by step through the more professional aspects of cookery. Taking everyday cooking a step further, you will master specialist cooking techniques and cuisine styles using professional cooking equipment. Classes are a maximum of four people so that you can get the maximum benefit as you delve deeper into the more complex world of culinary art. Get some friends together and have a drink and a laugh whilst learning a few new tricks in the kitchen. Suitable for 4 to 8 people, ideal for a girls night out, a warm up for a hens day or just for a few friends who would like to have their own exclusive hands on class. Organiser can choose a course structures to suit the group and will receive a thank you goodie bag valued at $50.00. In the 1930s, William Ricketts bought the four-acre bush block on Mount Dandenong and called it Potter’s Sanctuary. 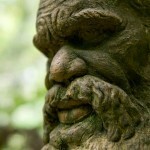 Word spread about the extraordinary sculptures that began to adorn the property. In time, the Victorian Government heard about his work and, in the early 1960s, the land and adjoining blocks were bought for the people. William Ricketts lived on at the Sanctuary into his nineties and continued to create his sculptures until his death in 1993.